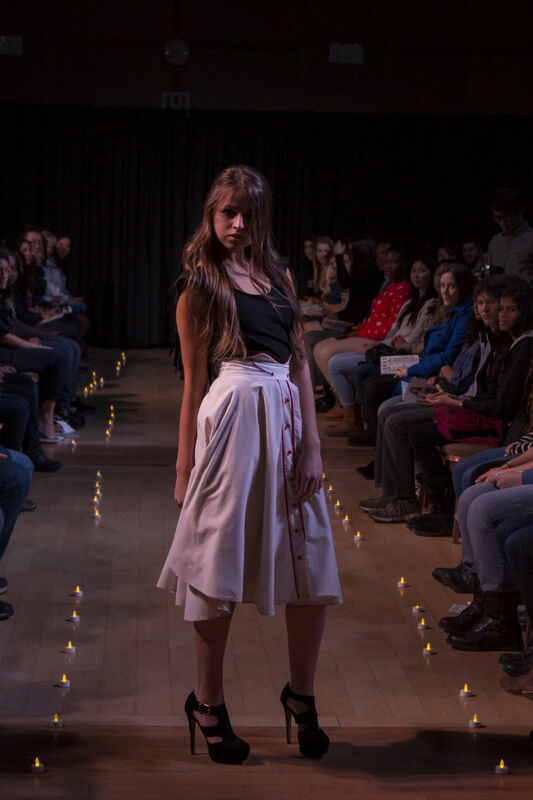 Meghan Hughes watched her designs take center stage during the Fashion & Retail Society’s annual fashion show, Sidewalk to Catwalk, on March 7. The Bostonian graduated from Lasell College in 2013 with a degree in fashion design and production. She attributes a lot of her inspiration to music and dance, two of her biggest interests. Today, she is a featured designer with Boston’s own 19th Amendment. I never had any sisters to play with, so I spent a lot of time with my great-aunt, who lived downstairs. I would help her put on makeup and play dress up with her clothes and jewelry. She has always had great taste and style, so I think I picked up my love of fashion from her. When did you know that you wanted to actually work in fashion? I’ve always been very interested in fashion and designing. I would sketch all the time and come up with different outfits and ideas, but I kept it to myself and never really acted on it. I started my freshman year of college at Boston University and quickly realized that I would be happiest designing. I transferred to Lasell College to major in fashion design and production. Music and dance are my most consistent inspirations. I love old school country- western and rock music — that’s where I get inspiration for more edgy designs. And I love the glitter and over-the-top embellishments of dance costumes and the way they move and fall on a dancer. My customer is someone who is a little bit of everything. She has a tough, outlaw side to her and a feminine, glamorous side too. She’s a confident person who isn’t afraid to stand out in a crowd. Why did you decide to participate in the Fashion & Retail Society’s fashion show this year? The Fashion & Retail Society put on an awesome show! It was a great platform to share my designs with a new audience and show alongside other amazing designers. In five years, I hope to have many more designs and regular customers who bring the designs to life.